One of the most deplorable habits still spreading amongst Canadian liberals seems to be anti-Americanism. The saddest thing about those who spout anti-Americanism is that their views aren't rebellious, original, or remotely unique. In fact, their views only exhibit their insurmountable ignorance and the nonsensical and hypocritical nature of their conformity. Canadians who proudly display their anti-Americanism in public and in private conversations haven't only failed at making themselves look intelligent, they've failed to provoke anything but laughter and ridicule from rational Canadians. The nature of anti-Americanism in Canada has no roots in logic, nor does it have any place in a country with a culture, military, and economy that depend so strongly on decisions that are made south of our border. What we're talking about here isn't mere anti-Bush or anti-war sentiment. What we're talking about is relentless, abrasive, and acerbic stereotypes being spewed from the mouths of ordinary (mostly liberal) Canadians on a regular basis, in conversations, on television, and in literature. Canadians despise being referred to as poutine pedlars being carted around the North pole in sleds. As Canadians, we should dish it out and we should be critical of American foreign and economic policies. We should criticize American presidents and we should ridicule certain behaviours. However, we shouldn't be so tightly strapped to the saddles of our high horses. We should be doing it without making the mistake of stereotyping all Americans in the very same way that we despise. Most Canadians view their country as a level-headed haven for peace, prosperity, and fairness. Others might view it as a haven for complacency, dependence, and big government. Canada's dependence on the U.S. seems pretty easy to overlook when we're busy indulging American customs, American foods, American movies, American sports, American television, American cars, American celebrities, American news, American books, American...I could go on, but I won't. Amidst all of this consumption and entertainment, we seem to have forgotten where most of it came from and who we should be thanking. Before I show you how ludicrous Canadian anti-Americanism really is, let me present you with some evidence of its existence – in case you've been in denial this whole time. Across this vast medium we call the internet – which was invented by Americans – we can find countless examples of anti-Americanism oozing from the pores of some ordinary, privileged Canadians. Take my very own Facebook page. When the topic of America comes up, there are quite a few people who will transcend the boundaries of logic and rationale to do something far less sophisticated than just share an honest criticism. Expanding out further into the public realm of anonymity, we find harsher and less reasonable forms of anti-American stereotypes and slander coming from so-called Canadians. On the website of Canada's beloved and unwatched national broadcaster, users are allowed to comment on news stories. In the example below you'll find a very self righteous and stereotypical anti-American comment being given “thumbs up” by over 1200 users. This example is only one of many. On Reddit, comments on the same story expose a continuity of hatred for Americans by Canadians. “[Today I learned] that Americans carry guns because they're pussies and fear everything,” says one Redditor, receiving well over 200 up-votes for his comment on Reddit/Canada. Engel covers a lot of subjects, including our 1 billion dollar trade relationship with the U.S. and the fact that 35% of our GDP comes from exports to the U.S.. The number of people who are employed because of our economic relationship with the United States is far beyond significant. In fact, it borders near dependency. Stretching beyond the rhetoric of average Canadians, anti-American sentiment can be found buried and hidden underneath the skin of Canadian media and television, like a parasite. This is either a reflection of the Canadian mood, or the Canadian mood is a by-product of the media's eagerness to portray Americans as ignorant, trigger happy morons. Since nobody really watches, values, or pays much attention to anything that is produced or written in Canada by Canadians, I'll assume our media's portrayal of Americans is only a reflection of our pre-existing sentiment. During the Wikileaks uproar, it was revealed that U.S. diplomats had actually shown concern over the CBC's proclivity for anti-Americanism. Leaked cables showed concern in the United States about “insidious stereotypes” being written into shows like The Border and Little Mosque On The Prairie. Let's not pretend to be surprised. The only thing these American diplomats got wrong was their assumption that most Canadians actually bother watching their own programs. As ratings show, most Canadians don't actually watch their own television shows. 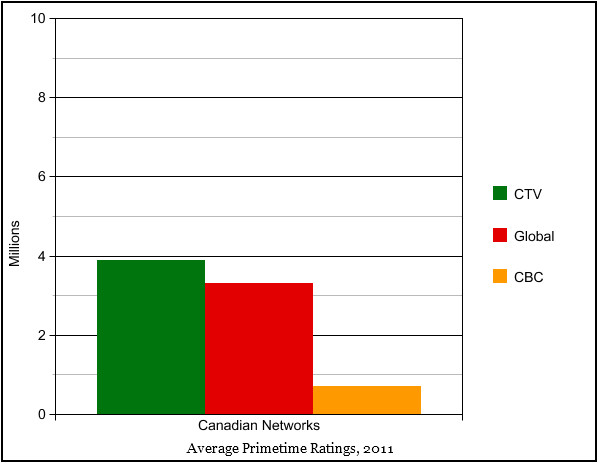 Although Little Mosque and The Border have been considered two of the CBC's top rated shows, the mathematics of the situation show a losing trend when compared to ratings received by American programs on CTV and Global. Little Mosque received an average of 1.2 million viewers per episode while Big Bang Theory and CSI have received upwards of 4 million Canadian viewers per episode. The numbers are similar for Desperate Housewives, Survivor, and American Idol – yes, American Idol, not the now defunct ratings loser, Canadian Idol. 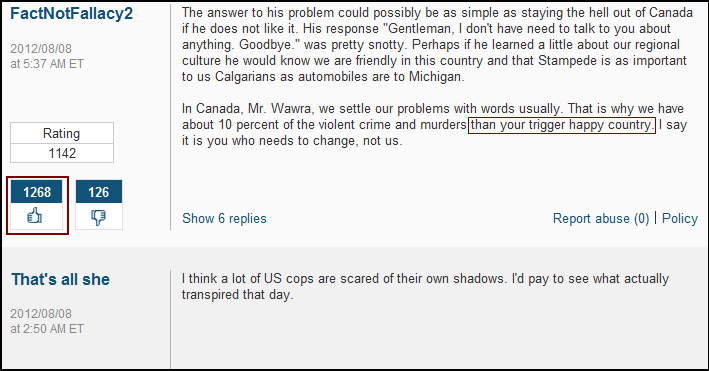 This unusual paradox tells an interesting tale about hypocrisy amongst anti-American Canadians. Not only do some of them show a tendency to bite the hand that feeds them, they completely disregard and avoid their own cultural creations while doing so. And, by cultural creations, I don't mean horrid coffee and stale donuts. It should be safe to assume that the only rational type of anti-Americanism in Canada would disavow anything and everything that is remotely American. This includes television, movies, literature, art, music, and food. However, the picture we see doesn't reflect this type of rationale – mainly because being truly anti-American would be self-destructive and intolerable. To disavow everything and anything that is American would be to disavow Canada itself. Without the United States, Canada would likely cease to be a “sovereign” nation. This is an unpleasant little irony that seems to evade the anti-American imbeciles that exist within our borders. If those trigger happy morons to the south were to suddenly disappear in a moment of hypothetical speculation, it's unlikely that our economy and our military would be able to sustain themselves. Our vast wealth of oil would likely become the property of China or Russia, not through mutual transactions but through expropriation. Any Canadian who believes that our current military would be capable of withstanding an attack or invasion from either country is clearly delusional and misinformed. Waiting for the Brits and Europeans to float across the Atlantic to defend us would be pointless, because the entirety of Europe would likely have its own invasions to deal with in such a circumstance. Not to mention the global economic chaos and collapse that would ensue if the US were to suddenly vanish off the face of the Earth. With all hypotheses aside, even with today's current situation, Canada's ability to respond to a significant domestic attack is dismal. This could be why our two countries have agreed to share troops freely across our borders during an emergency. In February of 2008, Canada signed an agreement with the United States to send and receive forces across borders. This agreement makes it possible for Canada to borrow US military resources when necessary. The likelihood of the U.S. needing our assistance is small, which makes the agreement more beneficial to Canada. Canadian bureaucracy may be partly to blame for what former CSIS director, Jim Judd, calls an “Alice In Wonderland” approach to terrorism. His remarks to American diplomats were revealed in Wikileaks cables that were released in 2010. Not only did Judd express frustration with Canada's ability to deal with terrorism, he also acknowledged “knee-jerk anti-Americanism” as a Canadian specialty. To put Canada's weak military position into perspective, we can compare our military strength to other nations. Canada has 68,000 active military personnel capable of defending the country's vast amount of soil during an invasion. China has an active military comprised of over 2 million military personnel. The United States has 1.4 million while Russia and India each have roughly 1 million. The United Kingdom, our next best chance of survival, has just under 200,000 active personnel. Technologically, the US military is the world's most advanced. On a list of the world's top 50 most powerful armies, you will not find Canada. For an oil rich country that ranks behind Saudia Arabia for having the world's second largest oil reserves, this is troubling. Despite being our obvious saviours during a hostile invasion, Americans are still subjected to pompous and self righteous slander from the North. Despite being the catalyst for our economic growth for the past twenty years, as well as our leading provider of entertainment, information, technology, and employment (Walmart, Starbucks, Target, Apple, Microsoft, etc. ), some Canadians still treat America like an ugly trailer park cousin from Honey Boo Boo. Thankfully, most anti-American banter doesn't garner more than a chuckle from the few Americans who actually bother to notice or care what some Canadians are thinking. Americans are far from perfect and their past and current presidents justly earn their harsh criticisms. However, Canadians are no closer to perfection or moral superiority when it comes to their own naïve perception of the world and their place in it, let alone their mass consumption of American celebrity gossip and sports. From arguments about hockey and basketball being Canadian inventions to Tim Horton's being the next best thing to church on a Sunday morning, Canadians often attempt to defend or justify their anti-Americanism by explaining their country's magnificent contributions to North American culture. The Americans didn't invent everything, you know. Although this isn't an argument about how stupid and infantile all Canadians are (but rather a criticism of some anti-American sentiment and stereotypes), it will still be met with the same defensive arguments about hockey, Alexander Graham Bell, the guy who discovered penicillin, etc, etc, etc.. 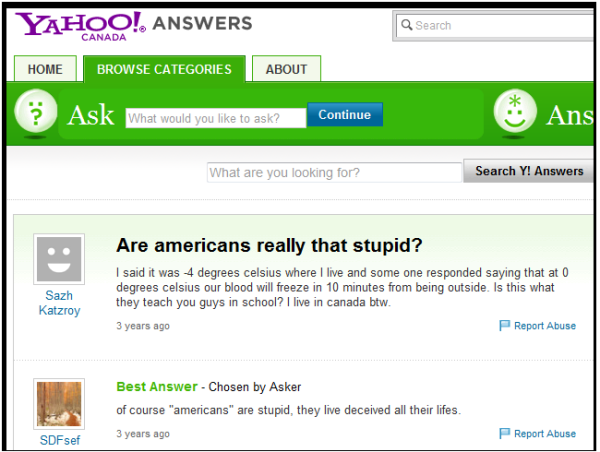 I am in no way calling all Canadians stupid or denying Canada's contributions to culture, medicine, and science. I am simply lambasting the irrational and obnoxious attitudes of some fellow citizens who have chosen to act like children by undermining the unique and important relationship we share with the United States. Names like Einstein, Tesla, Rand, Freud, and Bell take us back to a time when leaving your homeland for North America to pursue wealth, prosperity, and innovation were commonplace. Some fled wars and oppression while others came in search of greener grass. Maintaining and securing this kind of freedom requires a certain level of economic and military strength – a kind of strength that comes from the co-dependence we share with our trigger happy, celebrity obsessed brothers to the south. This reality isn't about to change, so we should get over it and start thinking twice before trash talking the very people whose culture, entertainment, and technologies we have become obsessed with. To be truly anti-American would require you to turn off your television, boycott the internet, sell your I-phone, quit your job at that American based company, and close your borders to everything and anything that is American. If you're unwilling to do this and would rather behave like a child by chewing off the hand that feeds you, perhaps your American friends should turn their backs on you when your naivety reaches its threshold and they finally grow tired of your sophomoric arrogance.